Prospect Lefferts Gardens Neighborhood Association (PLGNA) and PLG Arts present BETWEEN NEIGHBORS THURSDAY, OCT. 13 through OCTOBER 24, 2011 at 552 Flatbush Avenue, between Lincoln Road and Maple Street in Brooklyn (the old Mike’s International Restaurant location). 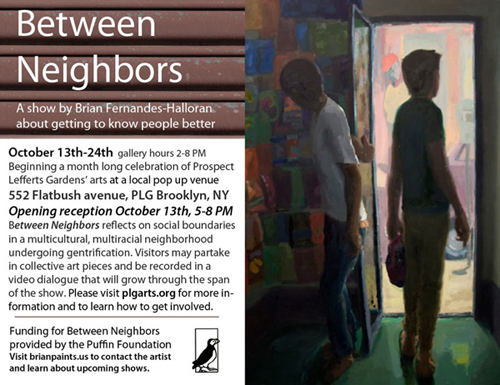 BETWEEN NEIGHBORS will showcase the local artist Brian Fernandes-Halloran. Brian will not only present his painting, but will provide interactive artwork and participation in a video dialogue that will grow throug the span of the show.